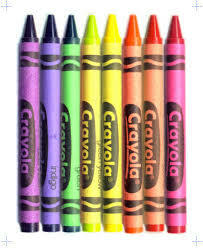 Crayola is the world’s largest crayon manufacturer and has developed over 400 different colours in its 110 year history. The first box produced in 1903 sold for 5 cents and had just 8 colours: black, brown, orange, violet, blue, green, red and yellow. In several Crayola customer surveys, blue continues to be the most popular colour in the box followed by red, violet and green. And Yale rated the smell of fresh crayons as one of the most recognizable smells in the world (more useless information brought to you by a librarian!). If you coloured your life just one color, what colour would it be? I asked this question to 8 friends and the majority said a blue/purple colour, with a hint of yellow just for fun. However, amazingly they also said…”Just one colour Kitty? Really? Life would be boring if I was just one colour”. Which lead me to think about that sign in front of the school and what it means. Embrace the library adventure: In all its shades, it is truly one of the greatest pleasures of living in library land…our diversity. Don’t get in a rut and use only one colour: As much as I love being a librarian, there is much more to a rich and full life than a career. Variety is truly the spice of life: Be more than just a children’s librarian or a law librarian, experience it all. Keep your crayons sharp: Keep on exploring and colouring outside the lines! Have the courage to use bright passionate colours: living with passion and courage is what makes life exciting and fun!! Librarianship is a rich box of crayons and may your life be the BIG box of crayons!!! Subscribe to comments with RSS	or TrackBack to 'Use the whole box of crayons! #33: 2013'. Thanks! What a great way to start the week! Mrs. Linda Youmans, B.A., M.L.S. [Description: Description: Description: Description: Description: Description: Think before you print.] Please don’t print this e-mail unless necessary. I have been a school librarian for ten years, worked in the library of a very large law firm for four, and volunteered many years in a psychiatric library. Although I am now a supply teacher, I do muse about returning to libraries every now and again. All of these experiences have coloured my outlook and certainly added a depth of satisfaction to my career. Libraries will always be my first love.